Thank you for taking the time to read our Parent Newsletter! The mission of our Youth Ministry is to not only serve the young people of our parish, but to partner and serve their parents as well. We want to keep you updated with what has been going on in our ministry, where your son/daughter could get involved, and provide you with some helpful resources. Thank you for your continued support and participation! January was a jam-packed month for HTYM! In addition to our weekly gatherings on Wednesday (Bible Reflection) & Sunday (Confirmation Class), we had our annual Year 2 Sponsor & Candidate Event, Morning Mass & Breakfast on the Holiday Monday, and our High School Youth Night (Broomball). Thank you to everyone who attended and to all parents who supported these events through their time and donations! We are looking forward to what we have planned for February. See the bottom of this newsletter for what we have going on this month for high school students. #2 on the Christian Billboard Charts, Who You Say I Am is now being played at Holy Trinity's Sunday Mass! If you need a change from your regular radio station on the school run or need to add more Christian Music to your life, try out 95.9 The Fish or 92.7 Air1. Or if talk radio is more your thing...the tune into AM1000 in the morning for a daily Catholic apologetic show. If you are interested in learning about the more our Catholic faith, the tough questions, or a Catholic view on current events, then The Patrick Madrid Show is a great companion for the drive to work/school. If you love coffee (or you know someone who does) then join us after all Mass times on Sunday February 24th for a cup of coffee that supports our parish Mission Trip to Mexico! We will be offering freshly brewed cups of coffee to go alongside your donuts in the Parish Hall. We will also be selling quality, freshly ground bags of coffee and all proceeds go towards funding our outreach in Mexico. We will also be showcasing all of the areas of service our Year 2 Candidates have been involved in as part of their Confirmation journey. Join us to support all the efforts of our community in serving others, just as Christ did. All high school girls are invited to Girls Night In! Spend a night with your sisters in Christ at Holy Trinity - hang out, eat, play games, pray, and eventually get some sleep. Contact Chentel if you want to join us! 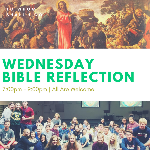 All High School students are invited to join us for Bible Reflection! We gather in the Parish Hall to hang out, eat, and reflect on the Word of God. All parishioners are invited to our Worship Night on Monday, February 12th 7:00-8:00pm in the Church. Everyone is invited! All ages are welcomed to join. February 18th is President's Day so we are going to Morning Mass at Holy Trinity then going out to breakfast. All high school students are welcome! Just bring some $ for food at Corky's! Our annual Discipleship Display will be held on Sunday, February 24th in the Parish Hall. Come and see all the displays from Year 2 candidates that show all the areas of service (discipleship) they have been involved in. Have a child in Middle School? Check out our Middle School Newsletter HERE. Almighty God, our Father, you who have given us life and intended us to have it forever, grant us your blessings. Enlighten our minds to an awareness and to a renewed conviction that all human life is sacred because it is created in your image and likeness. Help us to teach by word and the example of our lives that life occupies the first place, that human life is precious because it is the gift of God whose love is infinite. Give us the strength to defend human life against every influence or action that threatens or weakens it, as well as the strength to make every life more human in all its aspects.